As the operator of a vessel you are responsible for the safety of the vessel, of your passengers and those around you. Whether you are boating in a familiar or unfamiliar area, you must keep a proper lookout (by sight and hearing) for potential hazards and travel at a safe speed so that you are able to take appropriate action to avoid collisions. Rules are in place to protect the safety of divers in the water by regulating the operation of other vessels in the vicinity. It is important that vessel operators know what warning signals may be displayed when divers are in the water and the rules that apply to vessels operating in the vicinity. While some commercial divers may operate in specific areas, commercial and recreational divers may operate in any waters during the day or night. Further, some diving may involve operating from small vessels using a hookah – that is a long hose delivering air to the diver from a deck mounted compressor. 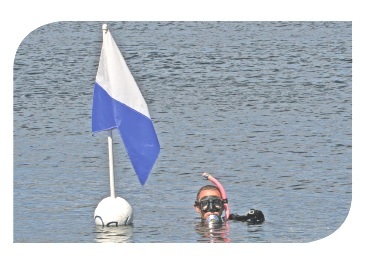 During daylight hours, the signal displayed to indicate that a diver is in the water is the International Code Flag A. It means 'I have a diver below – keep well clear at slow speed'. At night, a vessel (depending on its size) must display its required navigation light indicating at anchor, and in addition, either three all-round lights in a vertical line (top and bottom and red and the middle white), or an illuminated rigid replica of the flag visible all-round. When a diver is operating in a harbour independently of a vessel, a rigid replica of this flag, at least 300mm by 200mm in size, must be displayed at all times, from a buoy or float which is moored within 30m of the diver or is attached to a line and towed by the diver. The operator of a vessel operating in the vicinity of a vessel, float or buoy displaying a signal indicating the presence of a diver below, must navigate to avoid injury to the diver or interference with the vessel, float or buoy. Further, in South Australia, the operator of a vessel must slow to 4 knots within 50 metres of a vessel or buoy which is displaying a flag indicating that there is a diver below. When operating in this area keep a lookout for persons or equipment in the water and proceed with due caution until well clear. It is recommended, however, that you stay well clear of the area as a diver may be operating some distance from the vessel, float or buoy that is displaying the diving signal.